SIX YEARS OF MEANINGFUL PROGRESS. We are powered by many big hearts & brains that volunteer time, money & services. As a result, we’re able to put 100% of tax deductible donations towards our brain matters projects. Our expenses are covered by our RCDF events which, after expenses are covered, also fund these fantastic brain projects. Here is the impact you’ve made. We are pleased to announce that our AIM Brain Project is now fully funded! We are bringing molecular diagnostic testing to every child in Aus & NZ, this will be a first and a critical step in bringing the latest testing and treatment options to children. Headed up by Dr. Misty Jenkins the program will investigate how immunotherapy – treatments that harness the body’s own immune system to fight their cancer – can be tailored to treat paediatric brain cancer. Directed towards a personalised medicine brain program. In partnership with our US charity, $30,000/year from each and CERN, the best and brightest will be selected for this coveted Fellowship investigating Ependymoma. Increasing the number of young research talent taking an interest and entering the field of brain cancer means that more brains are on the job of finding new treatments. Personalised medicine is literally the cutting edge of cancer treatment. Through new discoveries about how DNA and cancer are linked, individually targeted therapies can be investigated for each child. Provide researchers with access to the quantity and quality of tissue and data they need to accelerate brain cancer research. Assisting RCH’s brain cancer tissue bank. This donation is in memory of Pippa Rea with generous support from her family and friends. Providing patients throughout Australia (referred via various children’s hospital referral program) with accredited music therapy at home to help the heart sing and the mind heal. Giving young researchers an opportunity to attend and present at important national and international industry conferences. Providing patients (referred via various rehabilitation centres) with yoga therapy at home to help the heart sing and the mind heal. Sponsoring conferences and seminars that gather the industry’s best minds and put the spotlight on brain tumour projects. This enables collaboration and begins forming a platform for the industry to form a plan for paediatric brain cancer. The Ion Channel Drugs for the Treatment of Aggressive Childhood Brain Tumours project, led by Professor Terry Johns, grew out of the Institute’s innovative Blue Sky program – a project aimed at encouraging high-risk high-reward research. The project involves further research into classifying different types of ependymomas and looking at empirical treatment data. The science of genetic sequencing of the tumours is improving and this can allow for better matching of treatment programs based on an individual’s tumour classification. This is a collaboration with Sick Kids Foundation Toronto. A new pilot program offering support for outpatients being treated for an Acquired Brain Injury (ABI). Additional funds have been provided to upgrade the equipment used in music therapy. An exploration into whether brain tumours could be better treated and have less long-term side effects by using synchrotron radiotherapy. Robyn Leonard, Founder of Brain Cancer Biobanking Australia (BCBA) and AMP Tomorrow Fund grant recipient. We’ve always said it’s better with more brains on the job. That’s why we’re collaborating with the two largest children’s cancer charities in Australia, the Children’s Cancer Foundation and the Kids’ Cancer Project Sydney, on key paediatric brain cancer projects. Think of the things we could achieve in a long-term relationship! 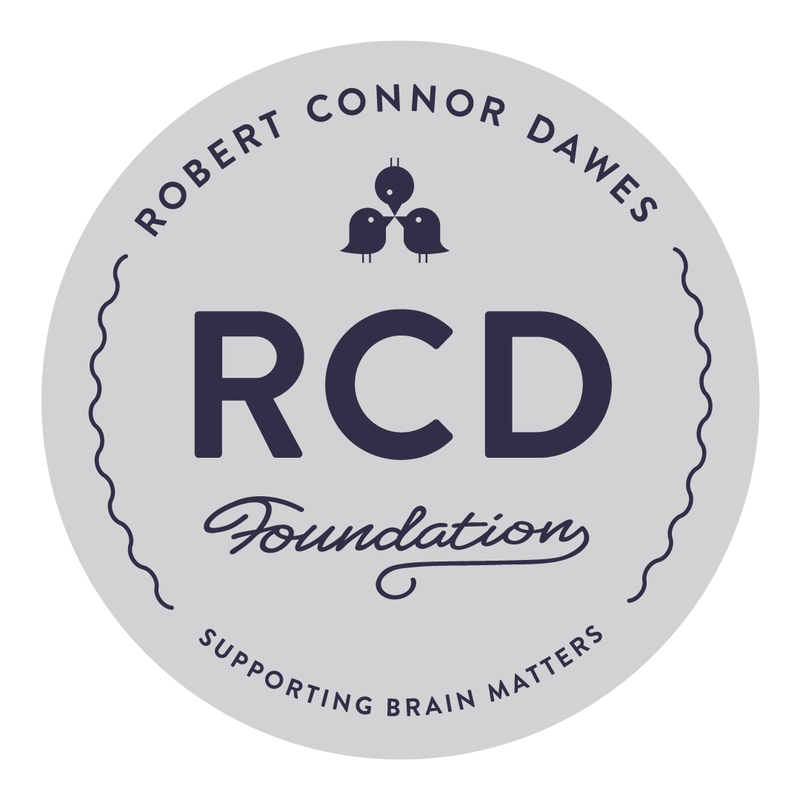 For as little as $10 per month you can become a regular donor to the Robert Connor Dawes Foundation and make a real difference for kids facing brain cancer. Find out more about becoming a Keeper.